The answer to these questions has been “yes,” a surprising number of times. It turns out that most of the people who have read my book are indeed totally crazy. Knowing this, I thought (what the hell?) it might be fun to take some of you along on my travels. Of course, these are not your typical tours. I’ve never been the kind of person who likes to see a country looking out through a bus window. For me, the most intoxicating part of travel is the chance to become someone else for a time. So I live like a local. I buy food from street vendors. I take public transportation. I even drink the water (though I do boil it first). And because I don’t always plan my trips thoroughly, a lot of unexpected things happen. But that’s half the fun. Whenever I get to a new city, there’s always the hassle of finding a place to stay, figuring out where the hell anything is located, and lots of times this happens after dark when it’s not a good idea to be looking like a lost foreigner. I much prefer to have a local pick me up and take me home, not just to save me stress. It’s that I’d rather stay with someone who knows the hidden corners of a city that my Let’s Go or Rough Guide never seems to point out. I want to dive into a place, not skim its surface, something that’s impossible to do if you don’t know your way around and you only have a week’s worth of time. Think of me as your local. I’ll share my knowledge, my house, and my friends with you. I’ve lived in South America so long that by now Bolivians actually ask me for directions. And legally, I’m a resident. In La Paz, I’ll take you to get your fortune read at the Witch’s Market. I’ll also give you lots of coca tea to help you adjust to the altitude. We’ll have a relaxed dinner and ease you into Bolivia. I might even cook for you. The next day, we head to my city of Cochabamba. It’s a six-hour bus ride that’s worth the trip. You’ll drop your things off at my house and we’ll head to La Cancha, the huge outdoor market, filled with everything from produce to pets, handicrafts to witchcraft supplies. Over the next two days in this colonial city with near-perfect weather, you’ll live like I do. I’ll take you to any parties I get invited to. I’ll invite my musician friends over to play for you. I’ll take you to a traditional koa, the ancient ritual of purifying a house with burning herbs, performed monthly in nearly every Bolivian household for good luck. We’ll eat traditional and delicious dishes like charki (llama meat) and anticuchos (beef-heart shish kabobs with a spicy peanut salsa). We might also visit some of the good vegetarian restaurants in this city. Then there are the quaint pubs where you can try the national cocktail, the chuflay made with the national liquor, singani. We’ll also drink chicha, a fermented corn drink passed down from the Incas. Chicha is served in adobe houses, often by women in native dress who only speak Quechua. Anyone who sells chicha hangs a white or red flag outside their house. Everyone drinks from a shared coconut husk and spills some of their drink on the ground, a tribute to Pachamama, mother earth. 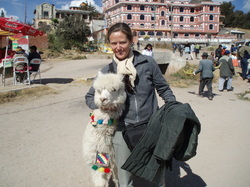 While there, I’ll teach you the Bolivian tradition of chewing on coca leaves. Then we’ll go to Villa Tunari for a day, the tropical jungle region just four hours from here. You’ll try succulent Bolivian freshwater fish like surubi and pacu and we’ll go into the jungle to see monkeys, toucans, pumas, and whatever other jungle life is around. We head back to La Paz, where I take you to Copacabana, a lovely city on the shores of Lake Titicaca, a place filled with quaint pubs and water views. Then I send you back to the States, fully rested and happy and filled with llama meat. Any complaints? If you have questions or are ready to come visit me, please email me at wendy@​wendydale.com. The price listed above includes all meals, transportation, and lodging. These prices do not include alcoholic beverages or the cost of getting from your home city to La Paz and back. Trips consist of very small groups, a maximum of four travelers. Much of travel is via bus and public transportation. Longer trips are negotiable. Personalized trips are negotiable. I live in Bolivia. Everything’s negotiable, for god’s sake. I should mention that space is limited due to the fact that I spend the majority of my time writing books. Once I have enough people, you’ll have to sign up on the waiting list. Getting your fortune read, Bolivian style. 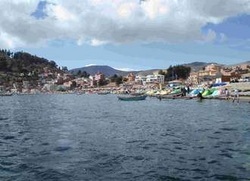 The town of Copacabana on the shores of Lake Titicaca. La Paz, the highest capital city in the world. Bolivia´s famous salt flat, the Salar de Uyuni. Trips here are on a request-only basis.